Democratic Republic of Congo, Republic of Congo, Cameroon. It inhabits densely vegetated areas of riverbanks. 30″ x 12″ x 12″ (75x30x30cm) – 70 litres. 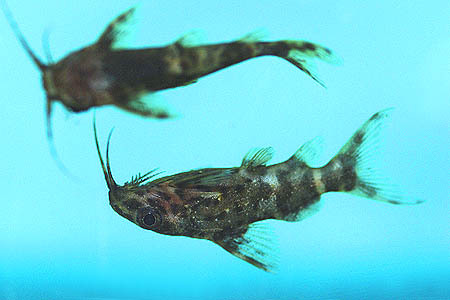 A single specimen could be kept in a smaller tank but this fish really should be kept in a group so a larger tank is required. A dimly lit aquarium with a soft substrate and rocks, pieces of driftwood and twisted roots arranged to form hiding places suits this species. Broad-leaved plants such as Anubias or Echinodorus and floating vegetation are also recommended as the fish like to roost under these. Synodontis are omnivorous and are most unfussy in terms of feeding. Frozen, live and dried foods are all accepted. It also relishes vegetable matter in the form of shelled peas, cucumber etc., which it will rasp at with the teeth in its lower jaw. Unlike most others in the genus, S. nigriventris will often feed from the surface in its typical inverted style. One of the most gentle members of the genus, S. nigriventris can be combined with most peaceful species successfully but should not be housed with aggressive fish. The most appropriate tankmates include African tetras, dwarf cichlids such as Pelvicachromis or Anomalochromis and small mormyrids. This species should be maintained in groups of at least 3-4 individuals as this will give them confidence and encourage them to be seen more often whilst also simulating their natural behaviour. The male is thinner and darker in colour than the female. Cannot be sexed using the genital papillae technique as it is too small. Has been achieved in aquaria but details are very scarce. As this species breeds during the rainy season and migrates to flooded areas, changes in the temperature and chemistry of the water are likely to induce spawning behaviour. We therefore suggest that a large water change with cold water may be a good place to start with inducing the fish to breed. There are conflicting experiences of breeding, which state the eggs were laid either in a depression in the substrate or in caves formed by lengths of piping exist. Therefore, both these should also be provided to maximise chances of success. Apparently, up to 450 eggs may be laid and the fry are free swimming after 4 days. They initially swim in the upright position before moving to the typical inverted position after 7-8 weeks. If you do manage to get this fish to spawn, we suggest that brine shrimp nauplii or microworm would be good first foods. One of the commonest Synos seen for sale, S. nigriventris is occasionally confused with S. contractus. However, on close inspection the species are easy to tell apart as S. nigriventris lacks the large head and mouth and larger eye of S. contractus. 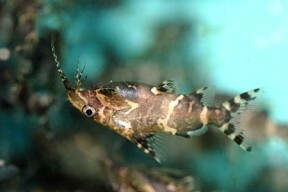 The scientific name nigriventris refers to the fact that the belly of this fish is darker than the dorsal area. 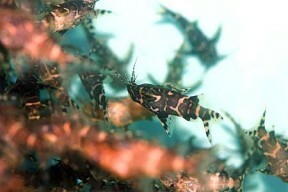 This is a form of camouflage, making the fish harder to spot by predators above, such as predatory fish, birds etc. It is a basic reversal of the colour scheme many other species use for the same purpose. The theory is that as S. nigriventris generally feeds from the surface in areas which are heavily vegetated above the surface, it is more important that it can see what is going on below it and thus it has evolved to swim in this way. This fish spends up to 90% of its time in the inverted position and there have been several scientific studies conducted regarding its postural control. It was discovered that neither the swimbladder or inner ear mechanics (used for balance) were different to those in other fish. Changes in gravity also appear not to affect the fish. However, what was found, is that the relationship between the central nervous system and the inner ear organ is somewhat unique, and has a self-regulating capacity which essentially “resets” whenever the fish tips beyond 22°, allowing the fish to remain stable. All in all S. nigriventris makes a peaceful and interesting addition to most community tanks and is highly recommended as an introduction to oddballs for the beginner.